This quilt still needs a binding…but just pretend the binding is there because you and I both know it won’t be sewn on for another week, and I couldn’t wait to post this quilt. Jane finally realized she likes getting her picture taken without me having to bribe her with 15 suckers every time I take a picture. She’s so much fun…and also a total nightmare to take to the grocery store (Walmart pickup is LIFE CHANGING). Also she still sort of smells like a baby and I LOVE IT. I love how this turned out with the cream polka dot background! Oh a whim I decided to quilt it myself and use the green plaid from my Hazel fabric line for the backing. Quilting while listening to audiobooks and podcasts has got to be one of my favorite things ever (this and this were fun audiobooks I “checked out” from my library). 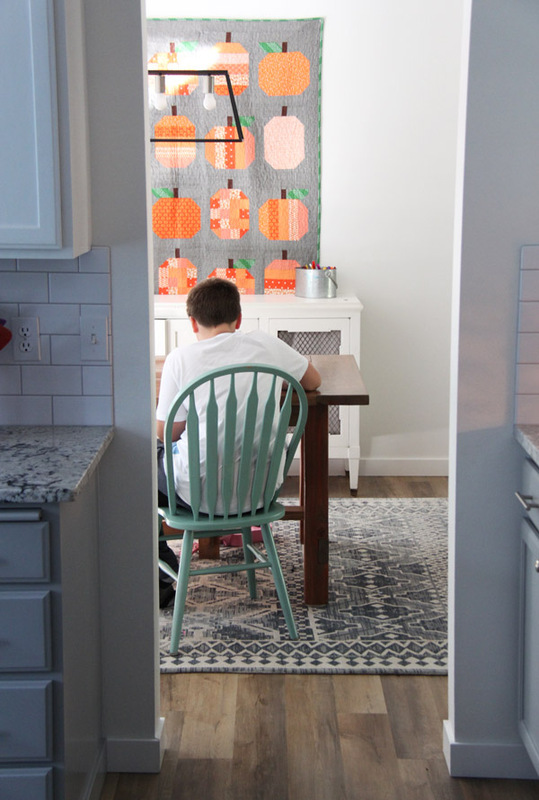 I hung my other Pumpkins quilt in the dining/homework doing room for fall. It’s very orange…it literally glows from the kitchen. It almost hurts my eyes in full daylight LOL. Speaking of homework… my Ben is in Middle School this year (yikes!). The background fabric I used is the Riley Blake cream and black swiss dot. The oranges are a big mix from my stash, but if you want to know the name of a particular print just put it in the comments, most of them I know. 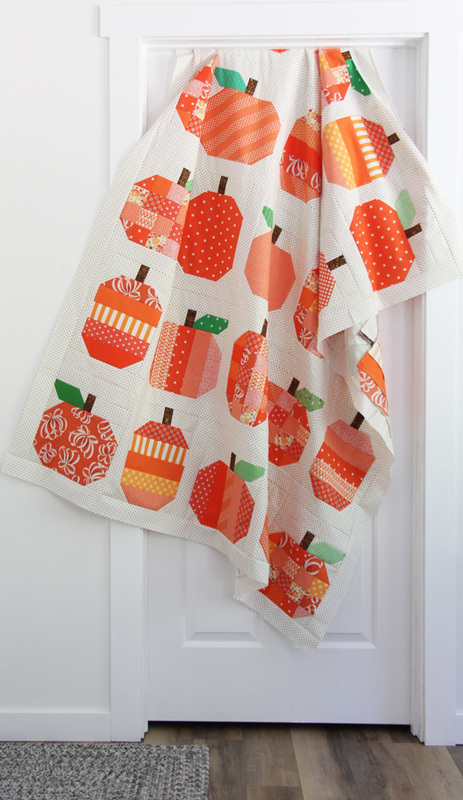 Info about my other older Pumpkins quilt can be found here. Pattern can be found here. 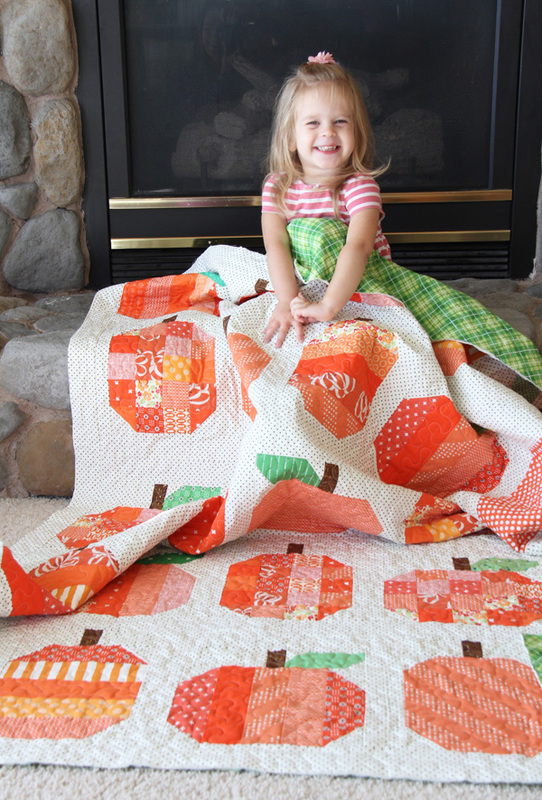 Love the pumpkin quilt and love the sweet pumpkin behind it. Adorbs! The quilt is just delicious looking! Thank you for sharing. Oh my…Jane is just adorable and what a smile…and the quilt is beautiful too! Looks like she enjoys pumpkins and now you have two quilts. Thanks for sharing this cute picture. Love how the pumpkin quilt turned out, especially with the cream colored background. And Jane is adorable as usual. Love it!! 🎃 I was just trying to buy the pattern, but site kept sending me back?!?! I tried about 3 times but no go😐 I guess it’s a no pumpkin quilt for me today😢. It’s still darling…. Oh how strange! If it keeps doing that email me at cluckclucksew@gmail.com and I’ll help you! It sounds like it’s your computer browser having an issue. Thank you! 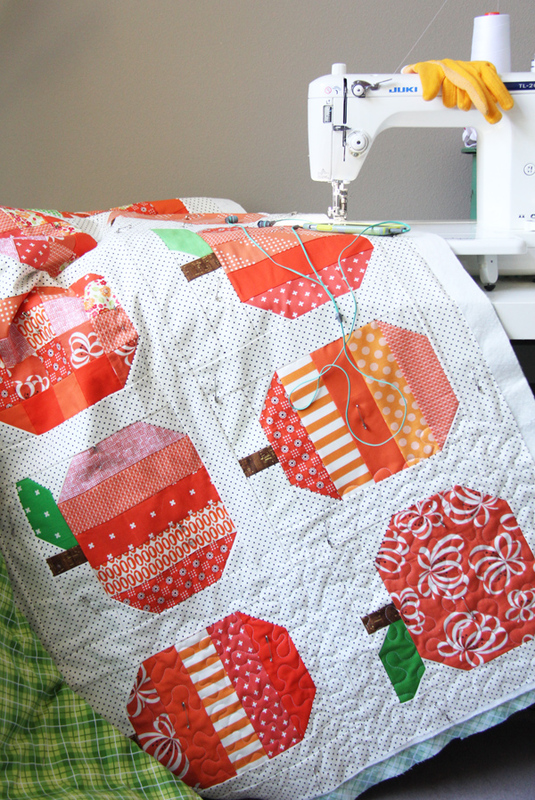 I have a few quilts like that too…its always the holiday-ish quilts that I fall out of love with! Thank you for visiting! Love that dotty background! It’s on my bucket list … which keeps getting longer and longer and loooonger! And also, Wal-Mart pickup is a total game changer! In my neighborhood, Costco and the grocery stores deliver or do pickups too! I love this pattern and am quilting it right now. It’s going to be a gift, so I’m going to have to piece another one for myself. I just emailed you back Mary….they are both fantastic!! Thank you for sharing them with me!! LOVE THIS QUILT AS I LOVE ALL OF YOUR QUILTS! I’m thinking these pumpkins can be turned into apples, a tribute to this go-picking apples season here in New England. I plan to make one of each and thank you for your sharing. If you think having a middle school kid is a yikes, wait until you sent him off to college, then wait until he marries. More to come my sweet, enjoy every minute with your kids while you can for soon enough (and time moves fast) they won’t be living in your household. Apples would be darling! 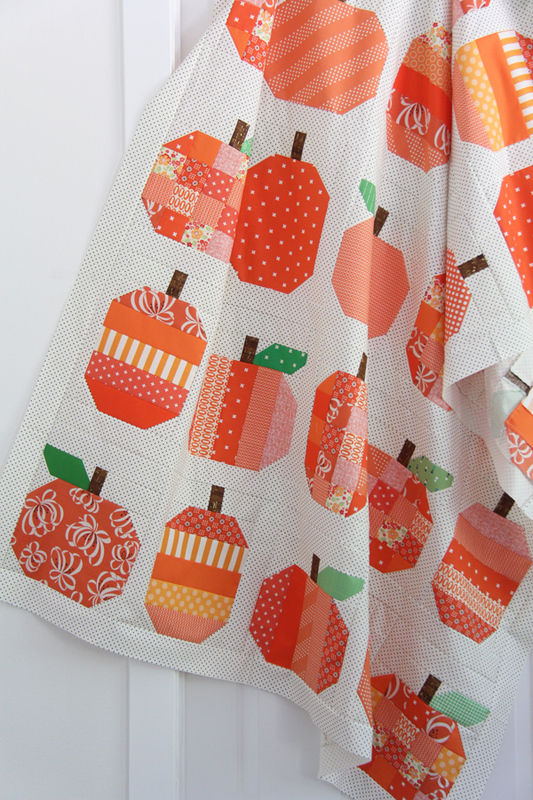 These would make great apples…especially the mini pumpkins pattern. Also yes…time is a thief and it’s so sad! Just finished mine! I hand quilted jack o o lantern faces on the pumpkins. It’s so cute!! Love the quilts! I have just discovered podcasts; they definitely make chain piecing, pressing, & quilting more enjoyable. Which ones would you recommend? So far Uncover: Escaping NXIVM, and In the Dark, season 1, have been excellent. Great suggestions! With podcasts I usually listen to self-help inspiring ones…like Soul Conversations (the Oprah one), Rise, Lore (scary! ), How I made that. I don’t listen to that many podcasts but I love them when I do! What a great quilt! I like the white background but it’s almost an off white because of the polkadots. I think these would also make fun individual cushions. Thank you! The background is a cream color…I like the cream with the orange! That would be cute! I’ve seen a cute acorn pattern floating around online.